Kinshasa (Agenzia Fides) - The socio-political, economic and humanitarian situation of the Democratic Republic of Congo (DRC) is dramatic, but the young Congolese have not lost hope and continue in the struggle for democracy and for the common good. 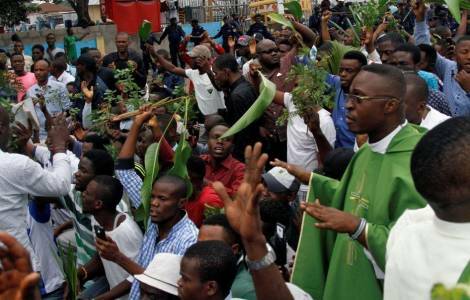 "After the collapse of the dictatorial regime of Mobutu, which reduced us to slavery for thirty years, we deluded ourselves that we would be freed from predators, from the burden of misery, and that we would have finally reached a state of law", says Fr. Simon-Pierre Kakiau, Congolese missionary and theologian of the Society for African Missions (SMA) to Agenzia Fides. "However - continues Fr. Kakiau - the Congolese current events shows that it was only a change of regime, and that the oppressive system and economic speculation have taken root. In this framework, the fate of the Congolese youth, like that of the entire nation, is uncertain. And there are negative indicators of strong concern: the persistence of the war fueled by the various militias, in the East and in the center of the country; the revision of the growth rate and the rate of inflation; the general worsening of transport infrastructure and quality of life (famine, lack of clean water, electricity and access to basic health care); insecurity and repeated kidnappings in Kinshasa and in militia-controlled areas". Faced with this tragic situation, "what will tomorrow's DRC be? Has the DRC not already suffered enough? And what is the role of the local Church in this historical phase? ", asks the missionary. "By virtue of its prophetic mission, the Church remains the only hope for the young. It is not limited to denouncing social injustices in all directions, but it also supports the young Congolese with its teaching of the Gospel and with social service, giving hope for a better future. The Church is a moral force for the nation in this dark period in the history of the DRC". "Already after the serious electoral fraud of 2011 - highlights Fr. Kakiau to Fides - only the Church had openly declared that these elections were neither in conformity with the law nor in accordance with the law. From that moment on, the only word heard by the Congolese is that of the Church. Thanks to the accompaniment of the Pastors, young people are aware of taking their destiny and that of the nation in their hands".